I also want to share links to my new Facebook and Instagram pages. I’ve been planning to start both for quite some time and now you are all welcome to be a part of them. Please feel free to comment, like, and share. Thank you to everyone for all of your past comments and encouragement. I’m hoping these new outlets will help to build on the interactions started here. My last few posts have been about oil painting but over the last week I’ve been back to working with watercolor. Both offer so many possibilities and have distinctly different feelings, both in appearance and application. 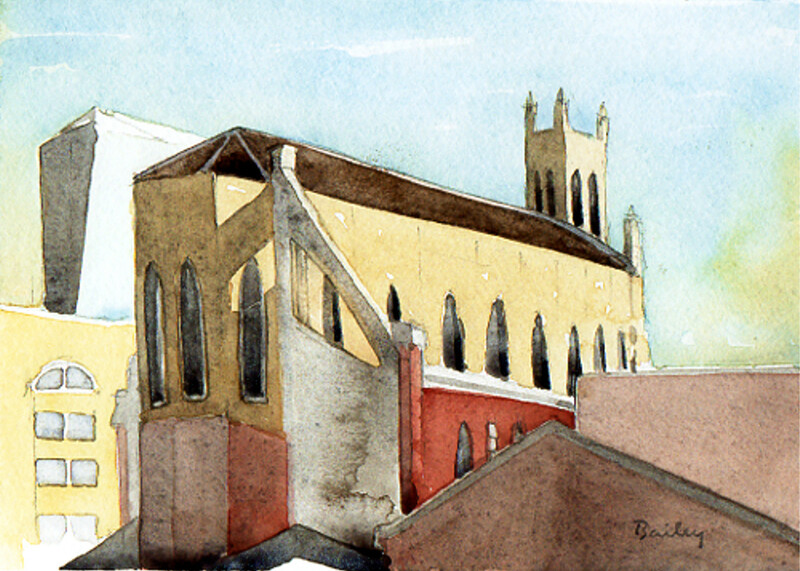 Most recently, I’ve been busy working on a couple of commissioned watercolor paintings. I’ve never mentioned it here before, but if you are interested in having me do a drawing or painting for you, feel free to contact me either here or at my Etsy store, ArtFromBrian. 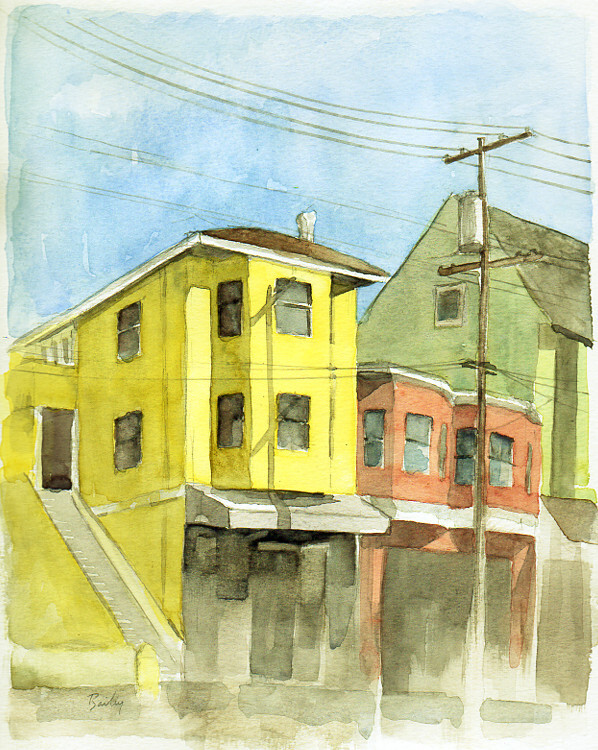 I also revisited one of my favorite subjects this week, the shadows and brightly colored buildings of Cole Street in San Francisco. I love the translucency of watercolor and trying to build a surface that sparks a feeling, something like a memory of the places I’ve been. If you’re interested in this painting, you can also find it at ArtFromBrian on Etsy. I woke up early yesterday and drove down the coast from San Francisco to take in the early morning hours at the foot of Mt. 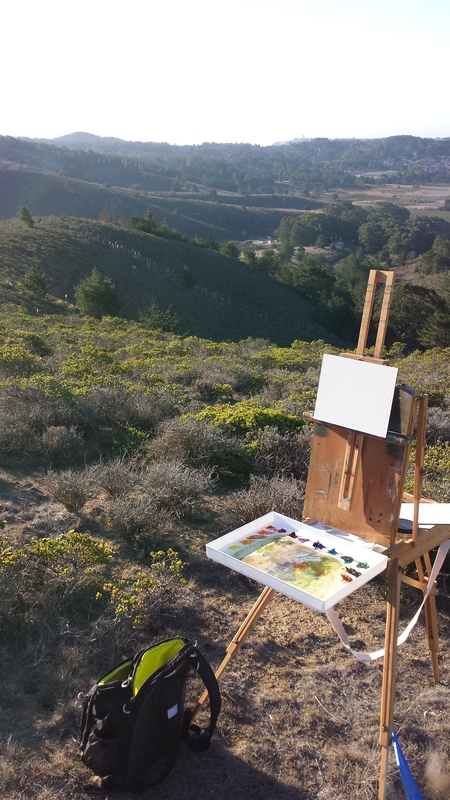 Montara and do some plein air painting. I took pictures with my cell phone camera to help share the experience. After a short climb up some steep trails with my easel and supplies in tow I settled on a spot where the sun was casting a shadow over the side of a hill dotted with trees. Here is the spot with the lighting as I painted it. I forgot two important things on this outing, water and bug spray. I should know by now that each of these can make painting much more pleasant but I still managed to really enjoy the day. 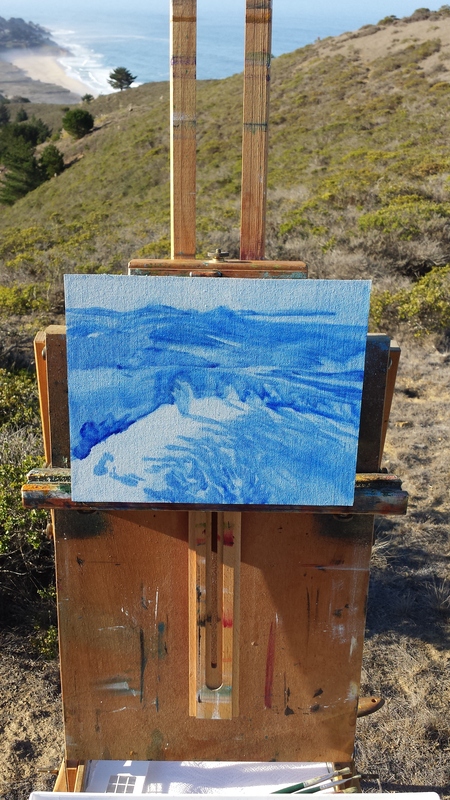 The sun was shining but with the Pacific Ocean just to the right of the picture and a bit of fog hanging around, I felt a chill and a coolness to the landscape so I started with an ultramarine blue underpainting to help relate the finished painting to how I experienced the morning. Over the next couple of hours, I developed each section using the underpainting as a guide for value relationships and leaving small flakes of the underpainting exposed here and there in the final painting which took on a cool and shadowy feeling. Changes in light, clouds, and weather present some special challenges to painting outside but I always try to keep in mind that I’m not copying what I’m seeing, I’m responding to it and the painting takes on a life of its own at some point. This was my first trip to Mt. 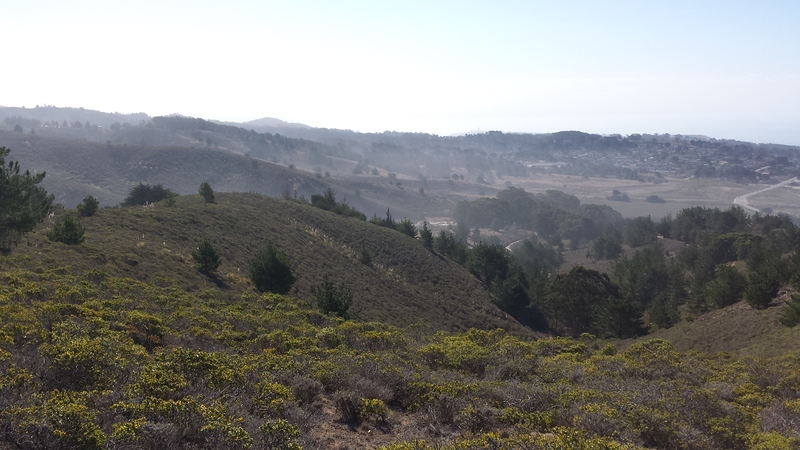 Montara at McNee Ranch State Park but I’ll definitely be going back for the beautiful views and relative seclusion from life in the city. I’m finding that the bay area has quite a few nearby place where you can forget how close you are to a big city and explore nature. 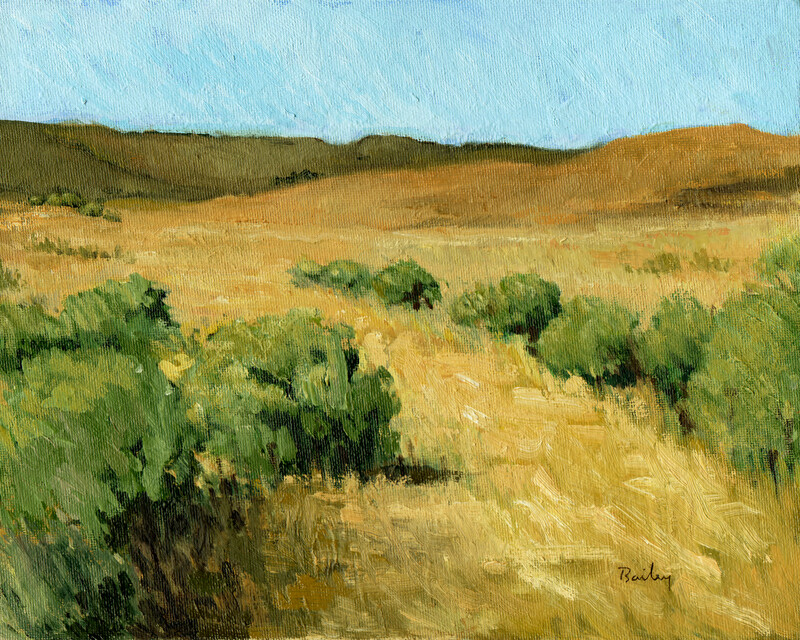 I’m sure there will be more examples of plein air paintings in the coming weeks. Thanks for reading and, always, thanks for your comments! I have been drawing and painting everyday for quite awhile now and I can feel my work changing. I can feel my relationship to painting changing and my insights feel more focused and tangible. I have a degree in art and have spent years creating and thinking about art but, in a way, I feel like I just woke up. I’ve spent a lot of hours reading about painting recently and, at times, I’m shocked by the things that never occurred to me. It can feel like there is an overwhelming amount to learn but this is also the thought that’s most energizing. There is always something to learn and there are always insights that are not obvious until you make a connection with someone else’s perspective. I feel more excited about reading than at any other time I can remember. My latest efforts have been in oil and mostly inspired by landscape. My wife and I went to Lake Tahoe for a wedding last weekend and managed to fit in a short hike to Fallen Leaf Lake. It was beautiful, and I came home with many new photographs. With this latest painting, I’m using a slightly heavier impasto and I think I’ll continue down that road, building some thicker surfaces. Thanks for taking a look and your comments are always appreciated. I spent an entire morning last week attending an exhibition of paintings by J. M. W. Turner at the de Young Museum in San Francisco. The exhibition was titled, “Painting Set Free”, and, aside from the crowds of people throughout the museum, it was a very enjoyable and educational experience. I wanted to write about my visit right away but decided I might need a bit of time to digest what I saw. For the last several months, I’ve been very tuned in to the tools artists use to create compositions and the illusion of depth in representational paintings. I was looking forward to looking at Turner’s paintings and unraveling the structures that underlie each work. As I walked around the first room, I was drawn to The Bright Stone of Honour (Ehrnbreitstein) and the Tomb of Marceau, from Byron’s ‘Childe Harold.’ My eyes followed the road past the people to the base of the mountains and snaked around to the right, along the edge of a body of water. 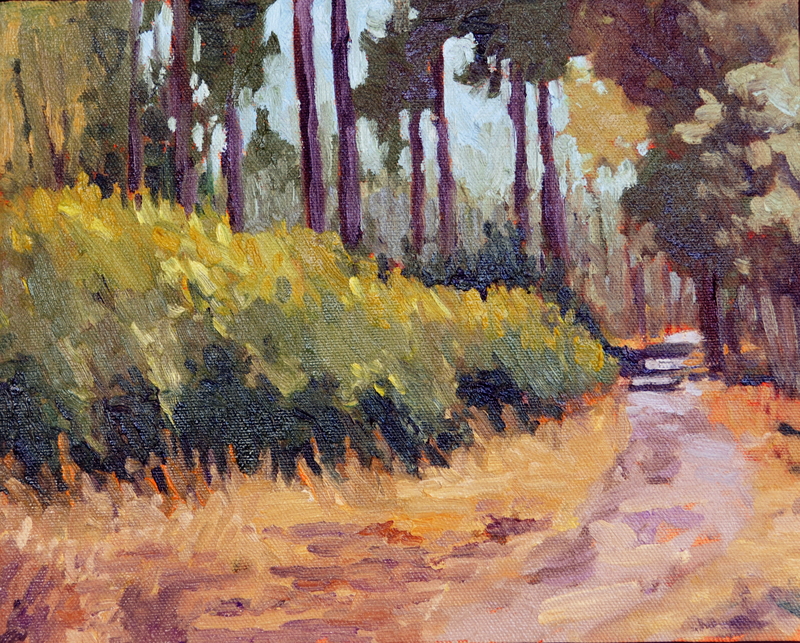 The brilliant light and shadows create many pathways around the canvas for your eyes to follow. My take away, was the composition seems to hinge upon the underlying S-curve of the road, similar to the structure of many paintings of rivers. I walked through each room and identified the structures supporting each composition, some obvious and others, seeming to challenge convention. In some paintings, one point perspective and radiating lines guide you to clear centers of interest and the compositions are balanced and orderly, others compositions are swirling with activity. One of my favorites was The Angel Standing in the Sun. After viewing most of the exhibit and looking at it with an eye toward understanding how the artist created the images, I was reminded why so many people are drawn to Turner’s paintings in the first place. I stood in front of one of the larger canvases, Fishing Boats Bringing a Disabled Ship into Port Ruysdael, and I was struck by the power of the image. Beyond the structure and composition of the work, I felt an emotional connection to the ships surrounded by haze and waves. Small ships pulling in a disabled vessel through a storm under a sky painted with layer after layer of wind and cold. The painting made me feel cold and afraid, as well as amazed by the human spirit and the bit of soul and feeling that went into the canvas. I’ve been thinking more about how important the relationships of shapes are in each painting. It’s not only the shapes themselves that create a certain feeling within a composition but their relationship to the borders of the surface. A shape very close to the edge of a plane can feel tense, as though it’s ready to fall off or it’s unwelcome. Shapes with edges that are tucked in about a third of the way from the edge feel comfortable and settled. The edges themselves change the way one shape relates to another. A softened edge welcomes and blends with an adjoining shape. One that is crisp can push away other shapes and divide the surface. The more I think and learn about composition, the more the elements on the page have a narrative quality. There is still so much to learn and, I think, that’s what keeps pulling me back to paint again and again. I painted Into the Fog from a photo I took of the Golden Gate Bridge while in Tiburon, across the bay, through the cloudy sky and fog. I’m still working on several paintings on small panels, like this one, and started a slightly larger work yesterday. I’m still considering what to do with the 36″ x 36″ canvas leaning against the counter behind me. 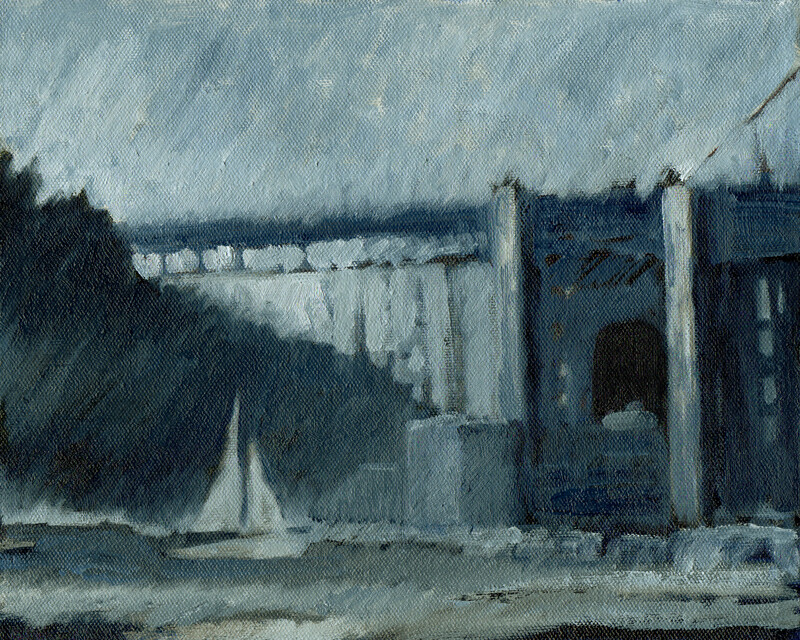 It’s interesting to think about, having painted small works for quite some time. I’ve been busy reacquainting myself with oil painting over the last couple of weeks and it feels great. 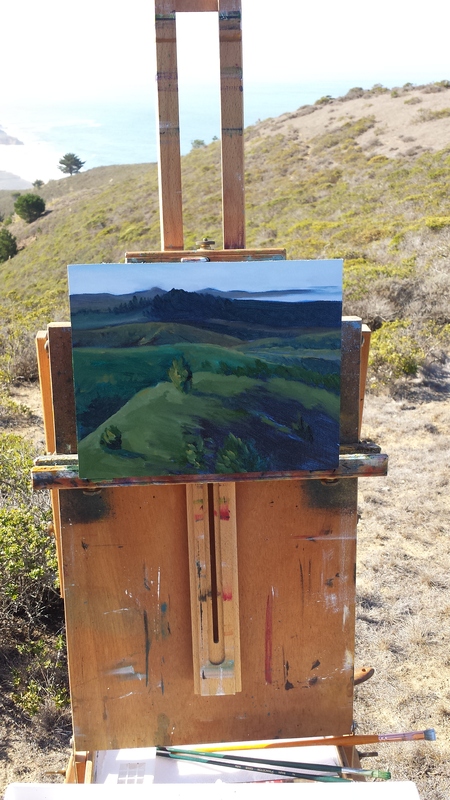 I’ve even gotten out and done some plein air painting north of San Francisco. 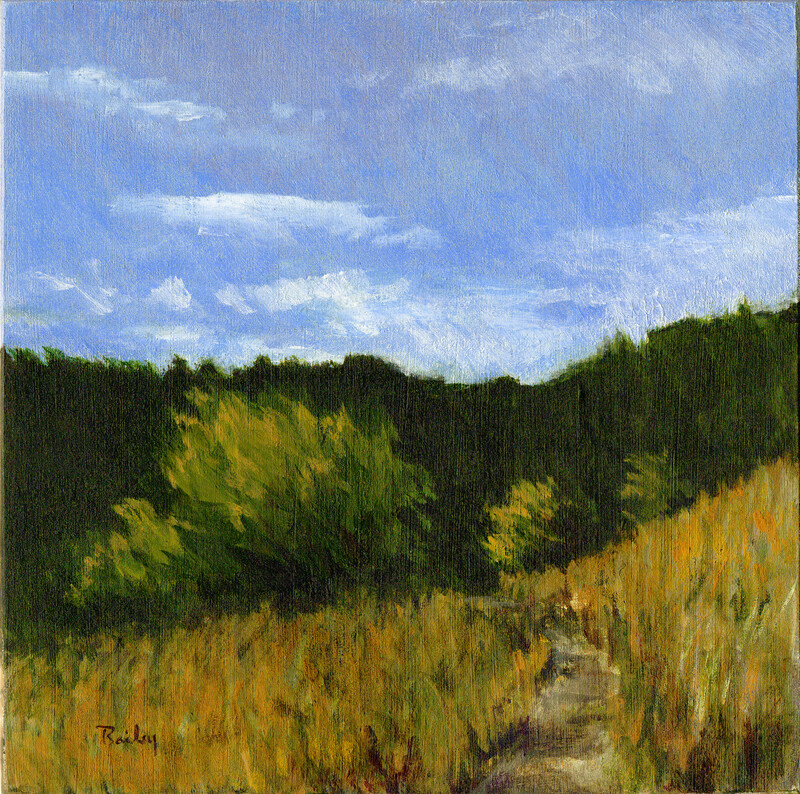 This first painting, August Field, was started that morning and finished at home. I’m still focused on thinking in terms of composition and experimenting with how the elements of a painting support each other. It really makes the whole painting process more enjoyable and engaging. I’m planning to continue oil painting on small canvases or panels like this one, experimenting with composition and, eventually, produce some larger works. 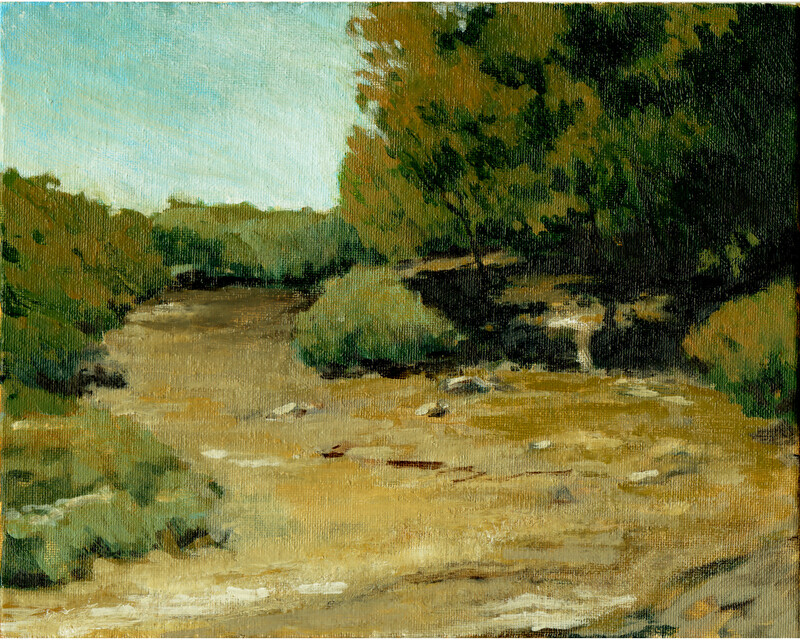 This second painting was produced from a photograph taken on the same morning of painting outdoors. 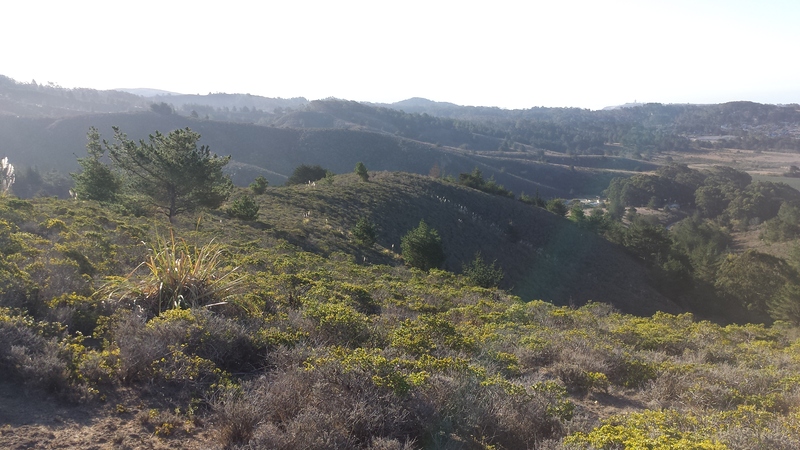 I’ve been drawn out of the city this week, north of the Golden Gate Bridge. My mind is consumed with all of the possibilities of landscape. I’ve been really trying to increase my knowledge of composition and am experimenting with a number of different landscape paintings. I feel like the arrangement of elements can tell a story more than I ever have in the past. It feels empowering to read about art and try to plug in to what other painters were thinking. I’m sure I’ll have more to share next Friday. As always, thank you for reading.